Hello lovelies! 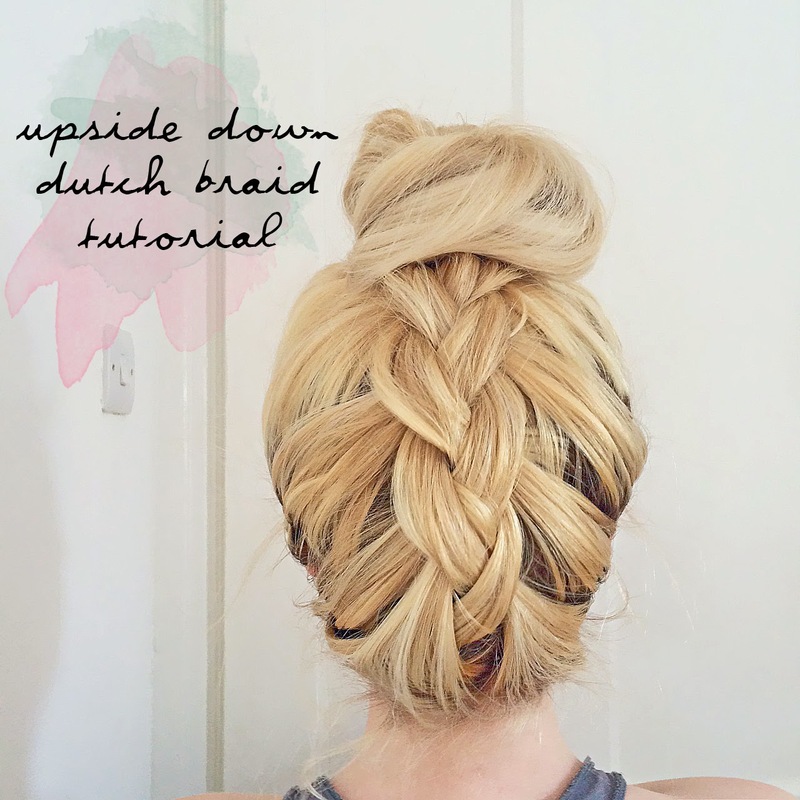 Todays tutorial is an easy one - all about the upside down braid. It sounds and maybe looks way more complicated than it actually is. So here is my step by step to achieve this look, which is great if you're in a hurry. One. Flip your hair over and grab three sections of hair just like you would with a normal plait. Two. Now grab the three strands and start plaiting - the thing with a dutch braid is when you're plaiting you plait going underneath each strand rather than over the top! This is what makes the look. Three. While plaiting and weaving underneath each strand, grab extra sections of hair and incorporate them into the plait - just like a french braid! Four. Once you've got your plait to where you want it, simply grab a hair elastic and tie your hair into a pony tail. Now wrap the hair around the pony, creating a bun. Pin that bun with as many bobby pins as you need. Five. Now everything is secure, you can make how you want it, i pulled my braid apart the make the plait thicker and messier. Six. You're done! and there's no heat and no sprays! The best thing about this is that your hair can be messy, greasy, straight, curly and it won't make a difference! Horray! I think this is one of the prettiest hair styles and I've been wanting to do it for ages, but my hair isn't long or thick enough for it to look any good! Looks so pretty on your hair though! Beaut! It looks so easy to do, may have to give it a go! The actual technologies that is right now each day already been utilized by the actual candidate within every single world therefore the existence in order they are able to consider it's assist in trying to get the actual a hundred and fifty pound loans. The actual lender certifies the facts for his or her authenticity through it's finish and when the particulars grow to be accurate you receive the enrollment quantity.